In production, productive resources are combined to create goods and services. This can be a simple process, like a classroom bookmark business, or it can be very complex, such as the production of an automobile. Economists refer to finished goods and services as output. The productive resources (natural, human, capital) are the inputs. Productivity measures the amount of output produced relative to inputs used. It is expressed as a ratio - output/input. Increasing productivity is perhaps the critical factor in determining a country's future standard of living. 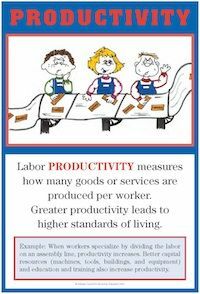 Because labor (human resources) relates directly to wages and living standards, the term productivity usually refers to labor productivity. It is typically measured as output per hour or per worker. In many cultures, animals are still considered important capital resources (oxen, mules, camels). Research and discuss different animals that help people increase productivity. List ways that people save. Discuss why saving is necessary in order to invest in capital equipment. Discuss the discipline necessary to forgo current consumption in favor of saving. Create a resume listing the skills and education that form one's human capital. Draw pictures of machines and tools that help increase productivity in the home. Draw a timeline showing key inventions in United States history. Discuss or write a short paragraph showing how each invention helped increase productivity. Discuss the advantages and disadvantages of increasing productivity by dividing the labor on an assembly line. Write a paragraph or essay entitled, "Why a Good Education is Important." Require students to include the concept of productivity in their paragraph.